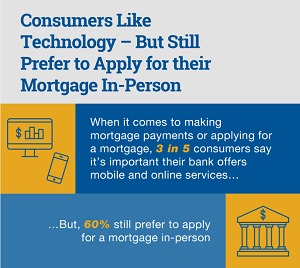 The majority of American consumers across all age groups -- 60 percent -- say they still prefer to apply in person for a mortgage loan rather than online, according to a new study by ABA. The majority of American consumers across all age groups — 60 percent — say they still prefer to apply in person for a mortgage loan rather than online, according to a new study by the American Bankers Association. Seventeen percent said they would prefer to apply for a mortgage online, while 23 percent were unsure. “Banks invest billions of dollars to offer their customers the latest technology,” said ABA EVP Bob Davis. 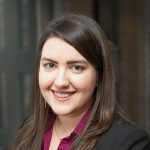 “But at the end of the day, nothing compares to sitting across the table, face-to-face with a banker when you’re making the single most important investment of your life.” While most preferred an in-person application, 61 percent said they consider mobile or online services very important for obtaining a mortgage or making payments. The survey also explored factors holding consumers back from buying a home. Half of all respondents said that down payment funds and homeownership fees such as property tax and maintenance costs were barriers to homeownership. Just over 20 percent of all respondents said that student debt was a factor. Among consumers aged 18-29 years, that figure was even higher — 39 percent of that particular cohort said that student debt was keeping them from obtaining a mortgage. Compared to other aspects of the home buying process, consumers say they are least confident in their personal knowledge of the mortgage process; just 34 percent considered their knowledge to be above average or excellent.